I'm in that lull between projects...spending hours looking through books, the internet and fumbling with EQ trying to decide what I am going to tackle. It is daunting. I do have my felt projects screaming for attention so I finally got myself to work on those. I was hitched up on dealing with excess felt in my lining for the wall hanging. Lynette from What a Hoot! suggested I try blocking the piece. I would never get the front of this piece wet with the unpredictability of dyes in the floss but the problem was on the back side so I figured I could get it moist and gave it try. Here's what it looked like when I started. I quilted around Santa's body in preparation for the blocking. and looks great from the front. Yippee! I am lining the whole piece again with a dark green felt so no one else will know about my little problem. I thought initially I would add dark green sequins too but I am not so sure now...I like how it looks without them. I might throw some on and see what I think...or not. There are star ornaments that are supposed to hang in three columns from the bottom of this wall hanging. I'm not going to add them to the wall hanging but they would be cute on the tree so I have started working on them too. I should get the Bowling Santa stocking finished...I'll get the lining to the front piece stitched in place tonight. A belated Happy Thanksgiving. No turkey for us in Paris. We will have to do that another day when we can be with our sons in Alaska. We are just like many folks, holidays are celebrated when we can be with our loved ones...sometimes just a day or two later...sometimes months later. If I can't be with my kiddos...then quilting is the next best thing. Added the borders to my "Paris Flower Shop," quilt. I think I already said this a few times...but I love this quilt! I have a tropical version drafted but am waiting for fabric to come with my son, Zack, when he arrives for a visit over the Christmas holidays. The past two days have been a noise assault. At times like this I really miss Alaska...even if it is a bit more cold and dark there right now. Two nights ago we had a drunk yelling on and off throughout the entire night somewhere near our apartment. The limestone exteriors of the all the apartment buildings creates a lovely acoustic effect...much like being in the Grand Canyon. Any sound is amplified and you really aren't sure which direction it is coming from. Then bright and early the next morning the jack hammer action around the corner from our apartment started. It has been continuing for the past two days and I saw where more spots were marked on pavement around the neighborhood for more asphalt/concrete breaking. Add to that a helicopter that hoovered near our apartment for a couple of hours last night. No idea what that was about but many movies are filmed in Paris and my best guess is it had something to do with that. Oh...and I almost forgot the neighbor who must be doing a little remodeling in their apartment...always at night...and sometimes after 10 p.m., I can hear them banging away at something. Not a conducive atmosphere for concentration needed for the finer details of adding borders that require math. I didn't even try cutting and sewing yesterday but I managed to get the first border of green on today...so far my math is adding up correctly. Those sequins around the border of my wall hanging are taking some time to put in place. I think it is also time to start putting up some Christmas decorations. I sure wish all the noises would stop!!! Last Friday morning I got mail at our Paris apartment. It was a notice that I had an appointment today to get my fingerprints taken for my annual renewal of my French visa. It was incredibly short notice and about three weeks earlier than I expected. Once again, my husband's company provided someone to hold my hand through the process. Today's appointment was so much quicker than last year's and I get to pick up my completed visa on December 15th...my current one actually expires on the 11th. Last year I was two months behind...I'm getting this process down now! I managed to get all the sashing and rows put together on my Paris Flower Shop quilt. Next up will be the borders. I'll double check my math tomorrow and get them started. I played with the colors in the photo to try and get it closer to what it looks like in actual daylight. I am halfway through adding the red and white checked inner border for my Christmas wall hanging. I've got a wavy area on the outside edge in the middle where Santa's tummy is drawing the fabric up. Normally by the time I add the backing to one of these projects it is enough to flatten out any issues like this...not this time. I am going to try backing the entire piece with another layer of felt...maybe some red to peak out behind the green. Red is the only color of felt yardage I have on hand that might work. Our last day in London we did a little shopping and all of the sudden I saw this store decorated with antique sewing machines. I have seen pictures of this store on other blogs but I actually stumbled into one. Called, "All Saints," it is a remake of an older, established British men's clothier, "Spitalfields." Talk about taking a theme and running with it! I felt like I was in a sewing machine museum. The salesman told me they have a New York store with 793 machines. Now that is some serious collecting. When they change their decorating scheme I would like to know so I can grab several!!! My sewing machine has been working on creating rows. Maybe I will finish the Christmas wall hanging by Thanksgiving. Starting a red and white checked inner border. Today on my walk along the Seine, I was just about to turn the corner and head home when I heard the distinct clippity-clopping of horses. I think it is part of a protest in France about an increase in the country's "Stable Tax," from 7% to 20%. I got to see a lot of beautiful horses. I just never know what I am going to see on my walks. Sometimes my husband does a late shift at his office...since he works for Fed Ex that is often a given...after all...it is a "Fly by Night," business. So I put a mini series on the DVD player and settled down for several hours of serious stitching. I am now just one letter short of finishing the dreaded satin stitched lettering. I did the final few stitches of a Santa ornament I mainly worked on while riding the train to and from London...yep...via the chunnel. Though not always cheaper than air travel...the trains are usually much less of a hassle and very speedy. This is "Nordic Santa." He needs a beard and mustache. And I got the front of the stocking done for "Bowling Santa." Now to line and add the backing. Hubby had a business trip to London so I joined him and we turned it into an anniversary celebration. Twenty-five years! We have always been able to avoid the rain on our trips to London and this time we had good weather again. We did a few different things than the usual museum trips. In this photo you can see the HMS Belfast. We did a tour of it...very interesting! It was a light cruiser in the Royal Navy. Participated in D-Day. It is now a wonderful museum. To the left of the ship is the Tower of London and in the background the Tower Bridge. Went to the London Zoo. I was surprised at how small it was...after all the British empire was so extensive at one time...and the entrance fee was pretty spendy! Guess I have been spoiled by so many great American Zoos. On my visit, the tigers were definitely the highlight. This one was licking the glass as it paced along in front of its audience. 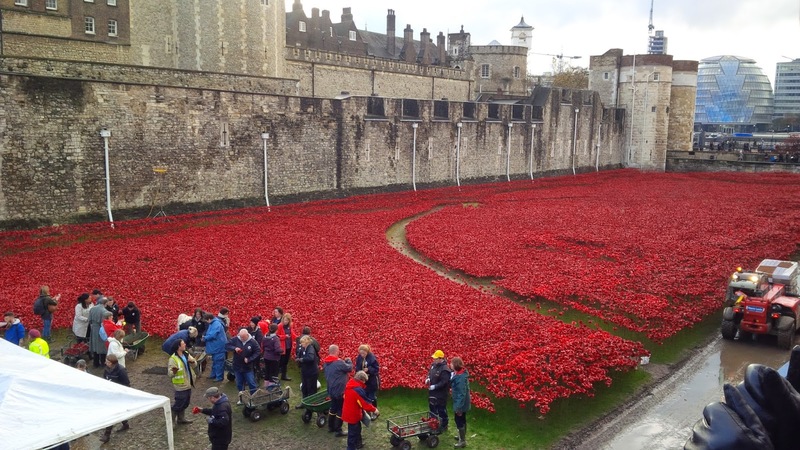 Did a quick look at the Tower of London's last few days of the Armistice Day display of over 850,000 ceramic poppies to commemorate the 100th anniversary for a World War I remembrance. All of the poppies were almost through being removed. Can you imagine? This is such a small area left with poppies and it looks awesome. I decided I had best try some typical British food...we normally eat ethnic...Indian and Asian fare being our favorite when we visit London. 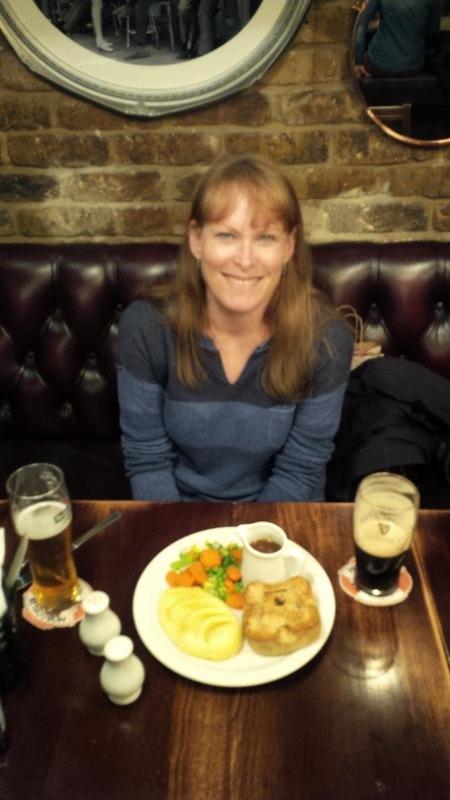 We hit a typical pub and I got a pasty...tasted just like my Mom's Marie Calendar frozen chicken pot pie! Our hotel had a lovely anniversary gift for us in our room. I am so happy I have a husband who enjoys musicals! We saw, "Les Miserables." Always so interesting to see how such a show is accomplished on a stage! We also saw a fun musical comedy, "Dirty, Rotten Scoundrels." Jumping on a train and heading home to Paris tomorrow. Tonight we went on a little adventure. Bryan had heard Paris has a Chinatown. We went in search of food. There was very little actual "Chinese" food but we did find a lot of Vietnamese and some Thai and Lao restaurants. Somehow...we managed to pick the "hot spot" for Vietnamese Pho restaurants. A table had just opened up when we walked in so we got seated right away and then proceeded to watch a huge line form outside this very small restaurant. We were on the early side for Paris...about 6:45 p.m. Many French restaurants don't open for dinner service until 7. This place is open continuously...no break between lunch and dinner. Not a great photo...a rainy day with a drippy night though the clouds were not dropping rain on us right then. This restaurant is called Pho 14. Just before we found it, we almost went into one called Pho 13 but we decided to look a little bit before committing. We chose wisely! It was good to get out as I spent all day stitching...it rained most of today. I played with the fabric I will be using for my setting triangles on the Paris Flower Quilt. I just hate the lighting in our apartment but I'm feeling pretty confident about my fabric choices so I got the sashings cut. (The colors just don't look right in this photo...it looks much better in person). I also got a couple of more letters satin stitched on my Christmas wall hanging. Will I get it done in time? The Bowling Santa stocking is humming along. Before Santa's beard went on, I redid his bowling shirt...the first go round had the shirt assembled in sections which left Santa with a weird line down the middle of his fat belly! I made the shirt one piece and then added it to the stocking base...now Santa has the proper, smooth, round belly. We made it back to Paris yesterday and found ourselves in the fall season...which is a good thing. I love the crisp air on a sunny fall day. I was ready to get back to my sewing machine and the internet. I did finish three cross stitch ornaments. I didn't need the internet to work on EQ7. I worked out a simple layout for my Paris Flower blocks. ...and a tropical version for my Island Flower blocks which I will tackle next. One of my sons is coming to visit at Christmas so I think he will be bringing me some background fabric...once I figure out what I am going to order. I might go with a pale turquoise...like tropical waters. So hard to decide. I brought plenty of brightly colored 2 1/2-inch strips. My first action this morning was to make another block. I need a total of 18 blocks...6 more to go. I know...my life is one big vacation! Now it is official. We are in the Canary Islands on the isle of Lanzarote. We came here last year and really enjoyed it. Perfect weather and very inexpensive. We are not right on the water this year but have a view of solitude. Here's our little home for a week. We flew from a small airport outside of Paris in Beauvais, non-stop to Lanzarote on the cut-rate Irish airline, Ryan Air. It was a good experience and very cheap! For a few extra dollars we were able to reserve our seat selection. It reminded me very much of flying on Southwest Airlines. We have internet but it is painfully slow so I don't plan to do much blogging...lots of relaxing instead.